Chertoma Ranch offers beautiful rolling pastures with scattered post oaks which then transitions into thick woods dominated by large post oaks, water oaks, elms, and white cedar. One of the real hidden gems on the property can be found just inside the woods, two large ravines, which converge at the 3.5-acre lake at the south end of the property. Chertoma Ranch offers spectacular fisheries for all levels of anglers. Topography: In order to really appreciate the dramatic topography this ranch offers you must come explore the woods. Two ravines ranging from 20-30 feet deep travel from northeast to southwest and northwest to southeast then converge into the lake in the south central part of the ranch. Behind the lake on the Southwest corner of the property, there is a high hill overlooking the lake. The highest point being around 450 feet above sea level and the lowest point at the lake being around 390-400 feet above sea level. See the topography map. Wildlife: The wildlife species that can be found on the ranch include whitetail deer, turkey, dove, ducks, and other vermin. The ponds and lake are stocked with fish and managed by Lochow Pond and Lake Management, one of the top fisheries managers in the State. Improvements: Located at the end of the long driveway is a 5000 sq. ft. 1.5 story custom built home. The stone home was built in 2000 and recently renovated by the current owner. Along with a nice kitchen and large office, the home has a large family room, living room, formal dining room, two master suites, and three additional bedrooms. Attached to the back of the house is a large cedar porch overlooking the lake with plenty of room for summer grilling and entertaining. At the front northwest corner of the ranch, there is an 1100 sq. ft. home which was built in 1989, which was recently renovated as well. It offers a full kitchen, 2 bedrooms, 2 full bathrooms, and large living room. Next, to the guest house, there is an equipment barn, hay storage pole barn, and a four stall horse barn. Water: The property sits on top of the Carrizo-Wilcox Major Aquifer and also the Queen City Minor Aquifer. Click for Geologic Map. 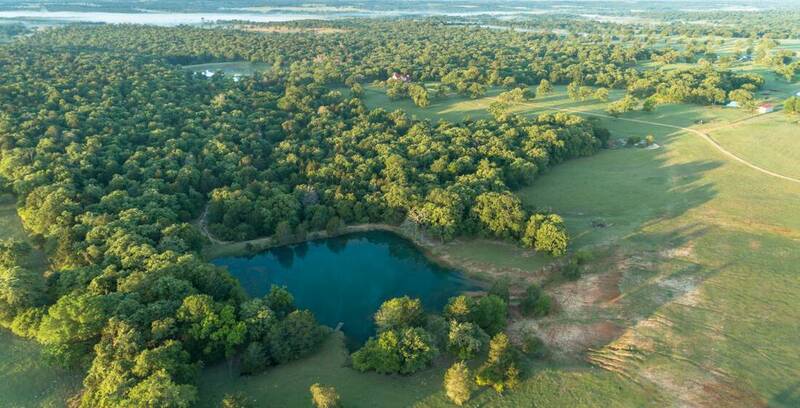 The +/- 3.5-acre lake is located in the south-central part of the ranch, it is stocked with Texas Native Bass, Florida Bass, Red Ear, Bluegill, and Crappie. Located on the Northeast side of the ranch is a +/- 1-acre pond with a fishing dock and picnic table. This pond is stocked with Texas Native Bass, Florida Bass, Red Ear, and Bluegill. Near the guest house, there is a +/- .6 acre catfish pond. The horse pen also has a .3 acre pond for watering and cooling off during the hot summers. The lake and ponds have 4-inch water lines piped to each of them to maintain constant levels year round. The well that serves the fisheries can produce up to 200 gallons per minute! Minerals: Currently there is not an oil & gas lease on the property and no known history of surface drilling on the ranch. The owner believes to own a portion of the minerals. Agriculture: The property is Ag exempt with Lee county appraisal district, this exemption is kept by grazing cattle. Location: Chertoma Ranch is located in the Northeast corner of Lee County, 7 miles from Lexington, Texas on CR 411. It is located only 59 Miles from downtown Austin, 132 miles from Houston, and 142 miles from San Antonio. “FURNASH, CHARLES,” Handbook of Texas Online (http://www.tshaonline.org/handbook/online/articles/ffu14), accessed June 05, 2015. Uploaded on June 12, 2010. Published by the Texas State Historical Association.